Visit these eight incredible bioluminescent phenomena around the world. Perhaps there is no greater magic than catching fireflies in a Pennsylvania blackberry thicket or walking on a river beach at night only to find each footprint glowing in the sand. Bioluminescence is a glorious phenomenon, showing up on different branches of the evolutionary tree over 40 separate times. Research into bioluminescent molecules even contributes to today’s research of cancer, HIV, and malaria. And while we know that bioluminescence results from a light-releasing “luciferin” molecule, scientists still don’t completely understand why and how the behavior occurs. But we do know we love it. From Puerto Rico to the Maldives, spots around the world are entertaining an increasing number of glow-in-the-dark tourists. So reserve your tour ahead of time and leave your cell phone at home. Here are eight locations where you can spend your time staring at something that glows all night whether it’s plugged in or not. Perhaps the most famous glow-in-the-dark spot, New Zealand's famous Waitomo Caves offer captivating views of rare, delicate glowworms. To avoid the crowds, check out these eight lesser known bioluminescent wonders. Every summer, fireflies twinkle through the leaf litter to find a mate in South Africa’s 1,304-acre Kirstenbosch National Botanical Garden. 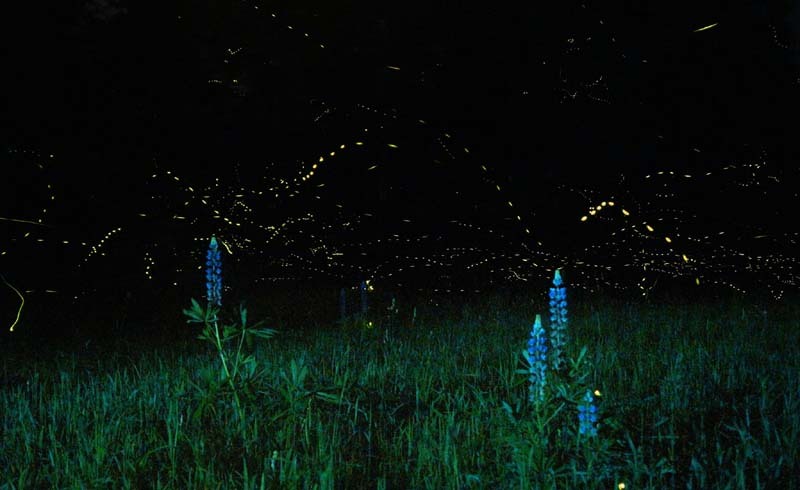 Traveling to see fireflies is like traveling to see the northern lights in Iceland: Nature’s timetable is about as reliable as your favorite airline has been lately. That said, the last three weeks of October are peak season. The evening tour promises a golden Table Mountain sunset, a guided hike past night-blooming drumstick flowers into a forest of fireflies, and a final stroll along the Boomslang—a 40-foot-high tree canopy walkway. Five minutes away, the 207-room Vineyard Hotel & Spa boasts solar-panel energy, luxurious rooms, and a garden café complete with resident tortoises. 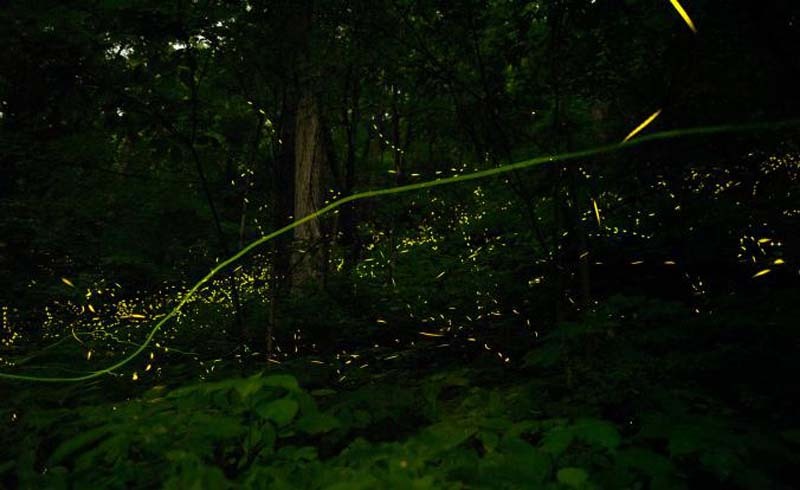 Bioluminescent firefly larvae glow to attract the termites they'll feast on. Brazil's Emas National Park is a largely untouristed gem with responsible, local eco-tours available. Emas is home to maned wolves, pampas deer, anaconda, giant anteaters, and over 200 bird species. 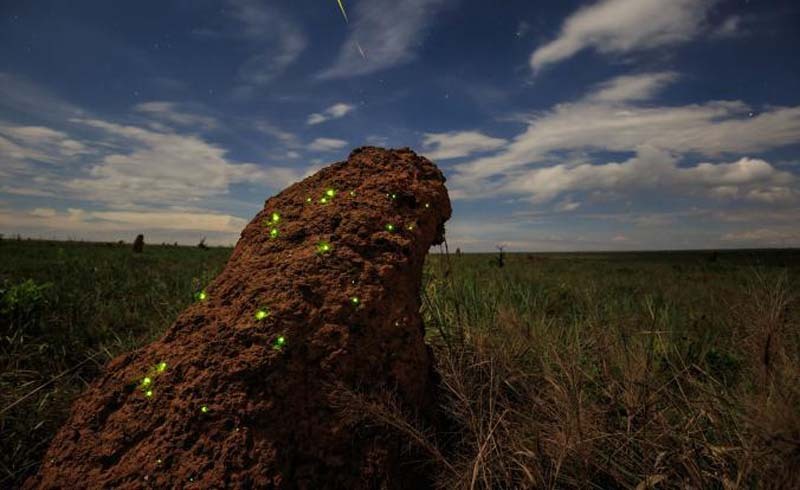 A tour during the winter rainy season promises a chance to see the world’s highest concentration of termite mounds sparkle with thousands of bioluminescent Pyrearinus termitilluminans—click beetle larvae looking to lure and dine upon termites fleeing the mound. Using a tripod and a long exposure, the mounds are an impressive show to capture on camera—even if they can’t be seen from space. In Japan, bioluminescent millipedes, mushrooms, and weeping stones illuminate the dark, and cities release fireflies all summer long like some shimmering, nonstop wedding send-off. Roughly 50 firefly species reside in the country—perhaps best observed from Onnenai’s peaceful wetland boardwalk on an uncrowded late-July weeknight. Further north in Toyama, an entire museum is devoted to hotaruika, or firefly squid, whose “counter-illumination” functions as an invisibility cloak from hungry sharks and whales. For seven dollars, museum visitors can brush up on squid anatomy and even stick their hands into a glowing squid-y touch pool. Late March through May, the museum also offers 3 a.m. boat tours of Toyama Bay, where working fishermen hoist tangled neon-blue hotaruika from the sea. Stay at nearby Oyado Nono Hotel for free late-night ramen and cypress onsen baths. After a Michelin-starred dinner (try Samphire) and a night of wading shimmering shoegazing (JWA rents wellies for only one euro (U.S. $1.15), visitors can stay the night in one of Jersey’s unique Heritage Lets, choosing between a historic fort, a cider barn, the 16th-century Elizabeth Castle, a seaside folly, or (perhaps the most convenient for bioluminescent-beach-walking) the solar-powered 18th-century Seymour Tower, only accessible during low tide. There are synchronized fireworks, synchronized baton twirlers, synchronized swimmers … and then there are synchronized fireflies. The rare Pteroptyx tener subspecies is found among the berembang mangrove trees of Malaysia’s Selangor River, just a one-hour drive northwest of Kuala Lumpur. Many local firefly tours use electric boats or traditional sampan boats in order to preserve natural habitat while reducing air, water, and noise pollution. As the state government, the Forest Research Institute of Malaysia, and local community members continue conservation efforts, visitors can help by leaving behind cameras and phones: electric lights distract long-lost lightning bugs from finding a mate. Dr. Rivah Winter, marine biologist and curator at Miami’s Frost Museum of Science, describes “Creatures of Light” as a family-friendly bioluminescent immersion with “larger-than-life-sized, biologically accurate models and interactive experiences that make the unfamiliar spectacular.” On view through April 21, the exhibit showcases bioluminescent mushrooms, glowworm caves, live flashlight fish, and Sharon Berebichez’s glowing marine sculptures, all accompanied by an original symphony soundtrack. Three hours north, BK Adventure offers eco-friendly tours in Merritt Island Wildlife Refuge, where you can glitter through glow-in-the-dark plankton in a see-through kayak, spot manatees and bioluminescent comb jellies on a sunset picnic paddle, or glide through the blue in a sturdy paddle raft—a great option for children or those with limited mobility. Guides suggest paddling on a moonless night, bringing long sleeves and plant-based bug spray, and booking the riverside B&B Casa Coquina del Mar for post-paddle hot tub lounging, homemade breakfast, and bottomless cookies. Visitors to the Cayman Islands can gape at bioluminescence and fluorescence both above and below the waves by scuba diving, kayaking, snorkeling, glass-bottom-paddling, paddle-boarding, submarine, electric boat, and even by pool noodle. Caymanian Tom Watling has guided kayakers aged 6 to 96 on Cayman Kayaks’ bioluminescent tours out of Rum Point. The main attraction, he says, are the sparkling photoplankton, “about 2,000 of them in every teaspoon of seawater”—that and the “disco shrimp,” tiny bioluminescent crustaceans that, in a manner simultaneously divine and disgusting, ooze specks of blue, bioluminescent vomit in order to attract a mate. Seven miles west of Bio Bay, the Kimpton Seafire Resort & Spa sports solar panels, rainwater cisterns, endemic landscaping, clean-lined ocean-view rooms, locally-sourced fare, and dark, turtle-friendly beaches. 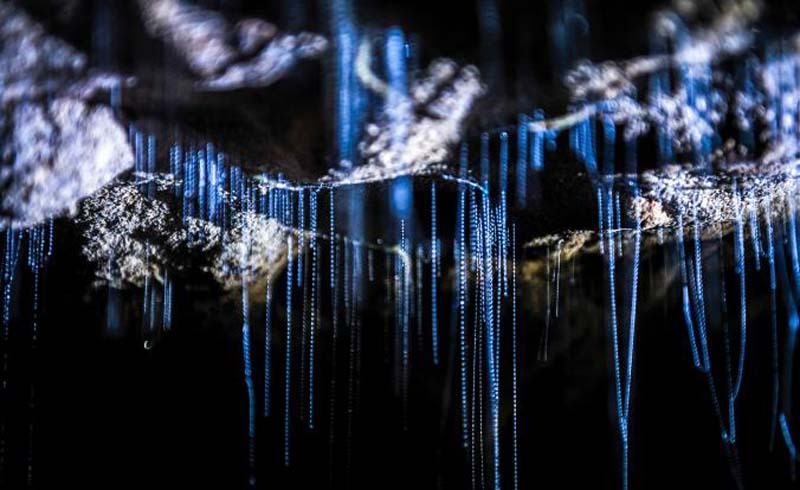 December through March, hundreds of glowworms dangle sticky bioluminescent threads to lure and capture unlucky flies in the caves of Springbrook National Park’s Natural Bridge. The glowworms—actually the larvae of a small fly, Arachnocampa flava, not worms—are found only in Australia and New Zealand. Springbrook’s easy half-mile loop trail to the cave also promises spectacular stargazing and a chance to spot luminous mushrooms, fireflies, ancient hoop pines and snoozing koalas throughout the Gondwana Rainforest. Head to Australia's Springbrook National Park to see Arachnocampa flava (actually fly larvae, not worms) light up to attract their prey. 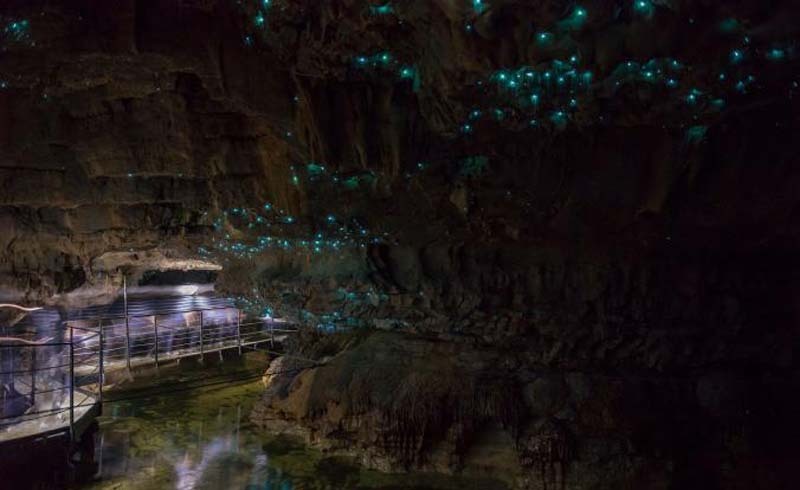 All visitors should abstain from flash photography, smoking, spelunking, actively spraying insect repellent, swimming, and shining flashlights directly on the glowworms, as this inhibits their wellbeing. Admission to the park is free, and guided tours are strongly encouraged. Nearby accommodations include cozy chalets, English Garden guesthouses, rainforest retreats, farm stays, and one park-designated camping area.